It’s hard to stay in the public eye when the president you are running against is going about the business of pulling his country through a major disaster. It must have been deemed inappropriate to hold a campaign rally while citizens up and down the East Coast were recovering from a devastating hurricane. So what could Romney do? There he was in Kettering, Ohio where things were all set for a Romney Rally. But then came the idea (I’m not sure who came up with it): there would be no rally! It would be a “storm relief event.” People were asked to bring canned goods to send to, hmmm... Right! The Red Cross can distribute those cans. 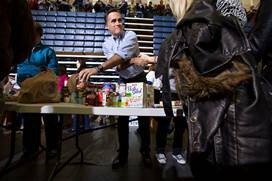 Americans love to help, so filling up a truck at the rally--no, not rally, storm relief event--seemed like a great way for Romney to contribute to the recovery. It was a good notion, but someone should have checked the Red Cross website. They do have a program through which you can donate money so the Red Cross can purchase the appropriate foods. While holding his “not a rally” Governor Romney wouldn’t answer questions from the press about some derisive comments he had made about FEMA, which he feels should defer to the states, which it actually does. But states are cash poor, so they need FEMA. Let me just say that I am not going to vote for Governor Romney. He still lies and is desperate enough to run an ad in Ohio showing cars being crushed, as a narrator says that Obama, "sold Chrysler to Italians who are going to build Jeeps in China. Mitt Romney will fight for every American job." In fact, Chrysler is retaining and expanding its Jeep production in North America, including in Ohio. Its profits have enabled it to consider expanding into China, the world's largest auto market. Plus the CEO of Chrysler Sergio Marchionne has responded to a series of Romney political ads by calling them, "inaccurate." Romney doesn’t understand what it means to be the leader of the free world, because he is not familiar with the world or how it works. Do not "not" vote even if you are not convinced about Obama. Not voting might make a statement, but will not change the system--and your statement may turn out to be one you’ll live to regret.